I was born and raised in a small Iowa town nestled in a little area off a state highway, population 300. There wasn’t much to it but what was there was pretty: an oval park smack dab in the center, and when the sewer running through it was covered up, was downright enjoyable to walk through. The hills were peppered with homes of all shapes and sizes and trees of all kinds – lots of trees in beautiful summer greens or bursts of autumn oranges, reds and yellows. The whole town was my playground. My two best friends lived at the end of my street. Dianne, Elaine and I were always together, running around the neighborhood or going to the park, and always wondering what it would be like to be all grown up. There were two churches in the town. The one sitting majestically atop the town’s highest hill, and the smaller one at the bottom and center of the town, on one side of the park. It was a town of The Catholics and The Non-Catholics. It was The Catholics who built upon the hill. No modest, unassuming structure for them, thank you kindly. The imposing brick structure had been one of five: the church, the rectory, the convent, the grade school, and the high school. The brick convent, grade school and high school were torn down years after I moved away. The Non-Catholics, on the other hand, were satisfied with a little white, dignified wooden structure that was heated by a pot-bellied stove. Growing up, my brothers and I were never allowed to fraternize with “those other folks”. I only know about the pot-bellied stove because I peeked through a window on my brother’s dare. To this day, I still don’t know who those Non-Catholics were, where they lived or went to school. But the Church hill is what I especially recall during these, my adult winters. That hill was always the best for sleigh riding. It was slanted downhill just right for keeping up your speed…long so it was a good ride and worth the walk back up…and, if you got the speed of the sled going just right, and caught those sporadic bits of ice patches along the way to keep your momentum going, you could get all the way to the flat bottom and keep a’going. We kids were catered to by the grown up folks during the winter, especially after a great snowstorm. An adult, mindful of the good snow and knew we’d get our sleds out, would grab a wooden safety beam with inverted V legs, and set it at the bottom of the hill, effectively closing it off to drivers. This assured we could ride down the hill in safety and not one adult soul minded having to go around to get where they were going, or that we slicked the road so bad during our sleigh riding, that it was a bit tricky to get up in a car. But I don’t think anyone really needed a sign. The adults just knew to keep their cars away from the church hill after a snowfall or they would run over a sledder. We kids wanted the best ride, not just an okay one. It was an okay ride if your sled stopped at Elaine’s grandmother’s house halfway down; a good ride if it stopped at Herrig’s garage as the street leveled; but a great ride if you coasted another half block to Manderscheid’s Tavern. We diehards who would use our feet to push a bit and making it to Manderscheid’s, always got off our sleds, cocky and proud while walking back the Herrig or grandmother groups. We knew our stuff – the wind direction, the icy patches, the bit of umph when you started at the top. None of which we shared with each other. After a couple hours, usually when the sun started fading, we’d admit the end of a day and drag our sleds home. My brother and I would park our sleds near the porch, ready to grab the next day, jump onto the porch and walk into the toastiest, warmest kitchen you could ever imagine…toes and fingers tingling and noses running. Usually, the smell of super cooking on the stove could be detected, amidst Mom’s loud “Don’t you dare track that snow into my house! Get those boots off NOW!” order. And so we did. As I look out now upon the snow capped roofs of my neighborhood…eye a neighbor shoveling the garage driveway…thinking I should probably do the same…I am not an adult woman…I am not living here. I am a kid, racing down that hill in Iowa…and you can darn well bet I’ll make it to Manderscheid’s tavern again. Although I live in a large city now, autumn always takes my mind back to the small town where I grew up. Our tiny hamlet was located in eastern Iowa, near the Wisconsin and Illinois borders. My family was firmly ensconced in the slow pace of small town living in the 1940s through 1960s, when the world intruded very little and the quiet was relatively undisturbed by either traffic or current events. Our house had a panoramic view of the entire town. In sweatshirt weather, when the air would get so crisp you could almost reach out and snap it in two, I’d sit outside on the lawn to look upon the town, and to think. Dusk would settle and the sky would get that purplish pink color it always gets around 5:30 PM on a late fall afternoon. Slim spirals of smoke would curl up from chimneys and perfume the town with the scent of burning wood. I wouldn’t notice it getting late until the ground turned so cool it started freezing my bottom. Only then would I march inside to be greeted by the blast of heat from the furnace and the smell of dinner on the stove. Only, we called it supper then. There wasn’t much to my hometown, but what was there was pretty: an oval park smack dab in the center, and when the sewer running through it was covered up, was downright enjoyable to walk through. The hills were full of homes and trees that turned the entire valley into an artist’s palette of beautiful, lush summer greens and flaming bursts of oranges, reds and yellows. Our little park always hosted and took great pride in Fourth of July celebrations. For reasons beyond my comprehension, thousands from nearby communities would join us for our patriotic eating and drinking, bingo-playing, carnival gaming, and then the piece de’ resistance; a rip-roaring dance under the pavilion. Wonderful memories, but it was the winters I liked the most. The same pavilion was iced over as a rink for skating, and we were usually there until it got dark and the streetlights went on, a signal to return home. Our noses would freeze, our toes would tingle, and our hands felt so numb you thought you’d left them somewhere back on the ice when you fell that last time. The small, brick bandstand always held the manger scene at Christmas, and since the baby wasn’t placed on the straw until Christmas Eve, you could sit on the bales and gossip while you took off your skates and rubbed your toes. The snow blanketed the trees and ground, softening our steps and our voices as we walked out of the park. Past the park and down the road past Junior’s Tavern at the end of the street, was a circular gravel area. A train once ran through the nearby pasture, and when I was little I had peeked into the abandoned depot sitting among the weeds. It had smelled old, and I wasn’t interested in what it used to be; at least not until that night when I was seventeen and my impression of the abandoned building changed. I had ventured to the dead end for the quiet solitude, to think. The moon was full and cast a deep shadow across the gravel, silhouetting the stillness of the night. I stared at the old depot for a long time, when passengers began to emerge from a fog into full view, getting off and on the train. The steam hissed from the side of the train, the iron clanked in the distance and the smell of metal assaulted my nose. Then it all faded away, and I was back to myself, staring at an empty building. I was hooked on the place after that. Years after I had grown up and left the town, a young man took it upon himself to refurbish the building. He completely transformed it into what must surely have been its original dignity, so like what I had witnessed that night many years before. Now the sweet little depot is a local attraction and open for tours on holidays. I cannot help but wonder if the young man who refurbished it had ever been there as a teenager at night during a full moon. Up the steepest hill and to the left was my family’s home. It was half a house, a cold-water flat with two rooms down and three up. Since we didn’t have hot running water, we always had to heat water in a big kettle on the stove. The kitchen was so small that the table and chairs had to be shoved up against a wall to make a walking space. Everything was a bit snug when we sat down to a meal together, which was three times a day. There was always a commentary on the menu. “How come we hafta have pork chops again? Can’t we ever have anything different?” we’d ask, no matter if we had pork the previous night or the previous year. “Just be grateful you have enough to eat. There are starving children in China who would really appreciate that,” Mom stated. I always knew how smart she was by how many people she knew…even children in China. The second floor’s corner room served as my bedroom. Once a dressing room for a bedroom, it was only the width of a twin bed, with just enough space for one small dresser. My bedroom claimed the only closet in the house. That was okay, though. We had very few clothes to wear so we needed little storage. A bathroom replaced the outhouse when I was about four years old, but it didn’t have a bathtub, so on Saturdays Mom grabbed a huge vat, set it on the stove and filled it with water. After the water was heated, she rolled the wash tub into the kitchen, locked the door against unexpected visitors, and called each of us one by one to our bath. I got to go first, because I was the girl. After my brothers and I outgrew the washtub, Mom took us to her mother’s, whose house had a bathtub. She caught up on the family gossip while waiting for all of us to get clean. When I wanted to play, I sought out my best friends, Dianne and Elaine. They lived on my street and we were always together, running around the neighborhood or going to the park, and always wondering what it would be like to be all grown up. We formed a new club of something or other every week, with the oldest (me) as president, then the next (Dianne) as vice president, and the youngest (Elaine) as secretary. We always started out the first meeting with a fresh pad of paper and a sharpened pencil, for meeting notes. After diligently recording our every “motion” for an hour, we soon tired of the routine and went off to the park to swing, or on our bikes to explore. The whole town had been our playground. That was the good part. The bad part was, I couldn’t go anywhere without someone knowing me, so I couldn’t get away with anything. By the time I got home, Mom had heard all about my latest misbehavior or transgression from at least three different people, and was standing on the porch with a flyswatter, ready to beat the evil spirit out of me that disgraced her, her parents, their parents, and their parents’ parents. There were two churches in the town. One sat on the east side of the park, the other sat majestically atop the tallest hill. It was the Catholics who built upon the hill. No modest, unassuming structure for them, thank you kindly. The imposing brick structure had been one of five: the church, the rectory, the convent, the grade school, and the high school. The brick convent, grade school and high school were torn down years after I moved away. The non-Catholics, on the other hand, were satisfied with a little white, dignified wooden structure that was heated by a pot-bellied stove. Growing up, my brothers and I were never allowed to fraternize with “those other folks”. I only know about the pot-bellied stove because I peeked through a window on my brothers’ dare. To this day, I still don’t know who those non-Catholics were, where they lived or went to school. The hill down from the Catholic Church was always the best for sleigh riding. The bottom would always be closed off after a good snow so we could get our sleds out and ride safely. But I don’t think anyone really needed a sign. The adults just knew to keep their cars away from the church hill after a snowfall or they would run over a sledder. It was an okay ride if your sled stopped at Elaine’s grandmother’s house halfway down, a good ride if it stopped at Herrig’s garage as the street leveled, but a great ride if you coasted another half block to Manderscheid’s Tavern. Once in a while I’d walk off alone to the south edge of town, traipsing through the old depot lot, heading to the pasture. The cows were usually gone to other fields during the day, so I had no worries about disturbing cows, or being chased by a bull. The pasture was full of adventure. 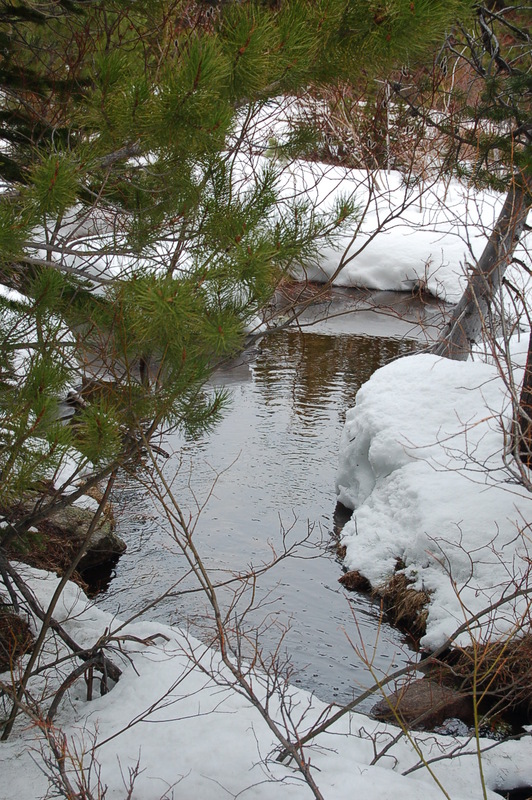 A small stream ran through it, fed by an underground spring. I loved to grab a mouthful of the water to quench my thirst, or simply sit there and watch the sparkle on the drops as they flowed down the rocky bank and into the shallow stream. Then I’d resume my hike and end up on a small hill that overlooked the town. There, among the rough bushes and occasional tree, I’d plunk my behind down, grab a long piece of the rough grass, slip it in my mouth for chewing, and then relax by staring across the empty field and pondering the questions that seared through my brain. Sitting there in the quiet of a summer afternoon, with the wild flowers peeking up and blooming in surprising places, the white clouds floating against a soft blue sky, and a gentle breeze caressing my cheek…it was impossible not to feel good. I felt safe, and I had found divinity there, in nature and sunshine, and alone with my thoughts. Autumn, winter, spring and summer…a town for all seasons. And although it may have been a sweet, summer afternoon in which I found God…it wasn’t until autumn, dusk and a sweatshirt…that I found heaven. Neighbors and being neighborly is not in vogue these days. My condo association is set up to keep this status quo: our garages are in front, our entry ways are in a courtyard, but we can’t sit there and jaw a spell, as the entryways are only large enough to have you walk in or exit easily. They are not set up to socialize. We can sit on our balconies, though, and relax. The balconies are in the back and staggered, so you don’t see or bother your neighbors. Everything screams isolation. Small town, Iowa, is a welcome escape and retreat. The town of about 3,000 has multiple businesses: shops, cars, bars, restaurants, etc. No parking meters, stay as long as you want. People stop in to purchase, to browse or simply, to chat. There are stop signs, but no stop lights. The flow is easy and straight. 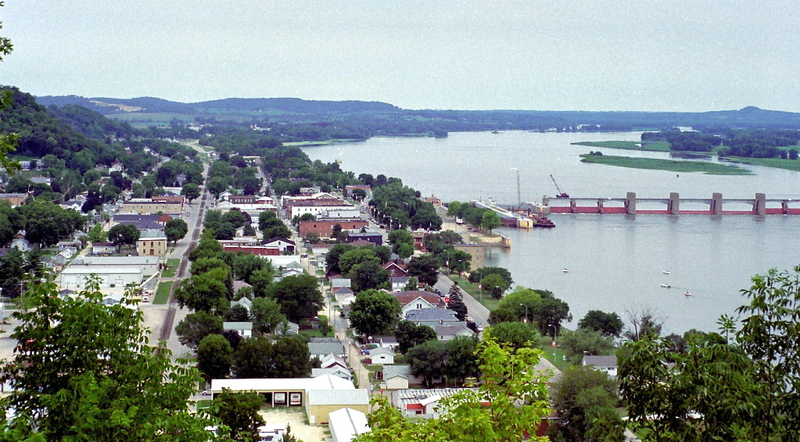 The Mississippi River forms a smooth, blue border on the left of the main street through town, and south of town is a bluff that hosts a small state park. Trees are every where and the back roads west behind the town eventually lead through the local hollow (sometimes pronounced “holler”).It is a visual delight with a calming effect. At the edge of town where I was visiting, the houses are well built and generously spaced. The lawns spread out like lush, green picnic blankets for giants. Trees – oak, maple, pine, ash – pepper the entire neighborhood, shading you at various times throughout the day. At night the sky sparkles with stars. Living in a large city, I often forget just how many stars dot the sky. The streets are quiet and past 10:00 PM, vehicles seem to turn themselves in for the night, too. It is like being rocked in a hammock on a desert island under the moonlight. In the morning the doves coo, the crows caw, and the turkey vultures soar high and gracefully above the trees on the ridge. A bald eagle flies by once in a while, but the little dogs that can be their prey are still safely inside their homes. Pieces of gravel pop beneath the sneakers of a jogger as she trots down the side road at the edge of the neighborhood’s paved street. A motor sputters and a pick up meanders past with bundles of rolled up hay in its truck bed. The town is stretching itself awake. You wake up just as slowly and gloriously, too, sipping good coffee on a patio in the quiet neighborhood where people are still neighbors. You hope you can still remember how to be one, too; at least, while you are there. 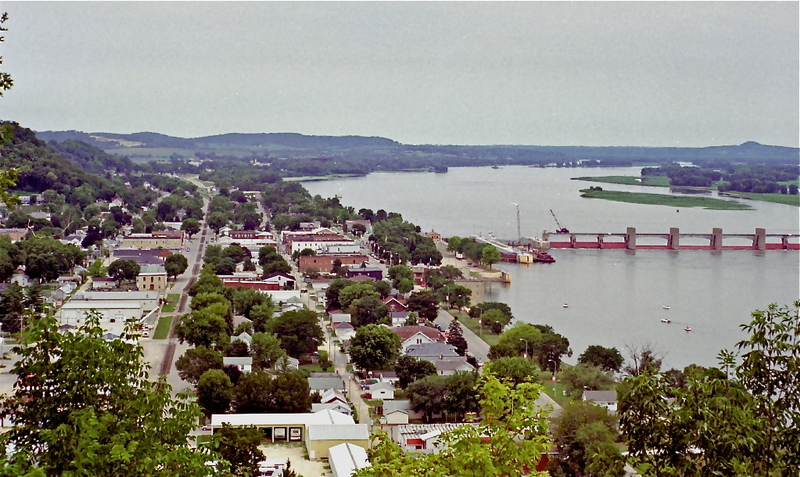 Bellevue is a clean, quaint town in eastern Iowa, comfortably nestled between two large bluffs along the bank of the Mississippi River. It boasts a population of nearly 3,000. If you’re coming from the tri-state area of Iowa, Illinois and Wisconsin, and heading south on Highway 52, you can’t miss it. The ride on Highway 52 is a pleasant one, winding past well-kept farms with herds of cattle grazing or horses romping in the pastures. The scenery in the distant hills hints that the closer to Bellevue you get, the closer you are to finding out just how impressive the natural beauty of this part of Iowa can be. When the highway starts its final descent into town about four miles out, the change is abrupt and gorgeous. Within the blink of an eye you are offered an astounding bird’s eye view of the great Mississippi River. Flanked by tree-lined bluffs, the river’s visibly flowing current in spring sings with promises of green landscapes and good fishing. In summer, the river proudly hosts the local water ski club and pleasure cruisers amidst the steady traffic of barges and paddleboats that come and go. 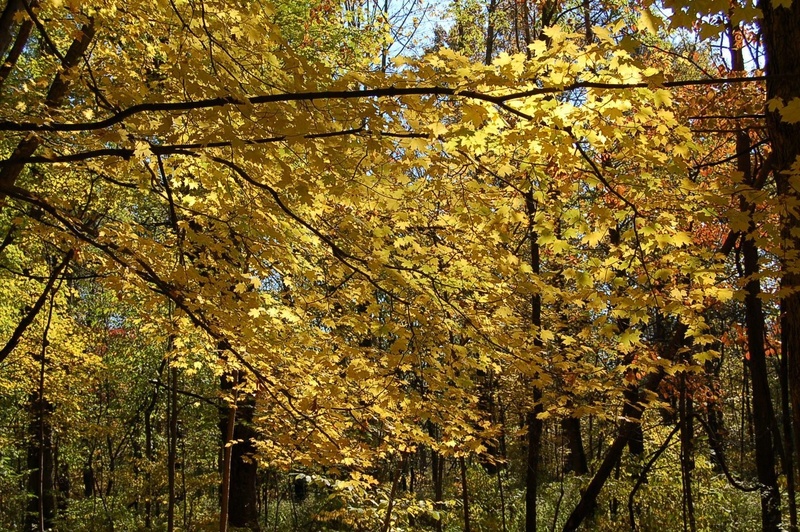 In autumn months, the river takes a supporting role as color whips into the Midwest, causing the trees along the riverbanks and in the nearby valleys to roar with bright, red, yellow and orange enthusiasm. It is not until the trees are stark and shorn of all foliage in the following winter season that the white, glacial carpet of ice catapults the river into the spotlight once again. Near the bottom of the descent is a road on the left that passes a small cluster of miscellaneous businesses. The road eventually passes by the town’s golf course and new homes mixed in with a few older homes that have been there since the anyone can remember. After Highway 52 winds a bit and crosses a bridge, you’ll spot a farm on the right with its driveway crossing the railroad tracks and climbing up the hill to a farm house. The thicket of trees behind the house that stretch out across the horizon are full of deer and wild turkeys. You’ll soon arrive in town and when you do, you have to remember your manners, even behind the wheel of a car. Oncoming drivers wave at you and expect a wave. Doesn’t matter if they don’t know you, you’re in their town, aren’t you, and it wouldn’t do for them to ignore you. The road takes you past Hammond’s gas station and convenience store on the right, just before the bowling alley and the power plant. At Hammond’s you can fill your car up with gas, grab a loaf of bread, some chips, and a bucket of live worms, all at once. That’s the local sheriff pulling in to say hello, making sure everything is okay, to grab a cup of coffee and talk over the latest town event. As you cruise down the street into town, you’ll notice that the Mississippi is at one of its wider parts here, and that the banks along the river are well cared for by the town. Benches aresecured here and there, next to a continuous and gently curving brick walkway. The drive offers you a direct view of the river’s lock and dam. If you’re lucky, you can catch a barge taking its turn going through the lock. The town’s banners, which hang from the street poles, proudly carry the slogan, “Where eagles soar,” because they do soar here. They swoop gracefully down to the surface of the water near the lock and dam, grabbing a fishy meal. Often, they roost in a tree next to Riverview, the main street through town, sitting majestically on the upper branches. The national bird is a favorite for sightseers, who come by bus to witness them in their natural environment. Depending on the time of year, you can also spot white pelicans that stop and rest on the small island above the dam, during their migration south. Riverview continues to stretch out lazily alongside the river, with most of Bellevue to the right of you. The street is lined with different types of small shops: antiques, crafts, a hardware store, an ice cream parlor that’s only open during the summer, and a few bait and tackle shops. There are no stoplights, so your drive along the river is steady and uninterrupted. The pharmacy’s just around one of the corners and down the block, halfway to the railroad tracks. It still has a hardwood floor that creaks when you walk across it. The folks there welcome you with a warm smile the minute you pop your head in through their door, even though you’re a stranger. They ask if they can help, then let you browse the couple aisles of cards, small gift items, and medicinal supplies at your leisure. Nobody’s in a hurry to have you buy anything. It’s perfectly okay with them if you just wanted to stop in and take it easy for a bit, or chat up the pharmacist. Across the street on the corner is a flower and gift shop. The florist shop is the one I use when I want to order flowers. The first time I called, I had my credit card in my hand and asked if they were ready for my number. The nice woman on the other end seemed a bit shocked at myquestion and said, “Oh, no! Just send us a check when you can.” The other part of the shop that stretches to the corner of the block sells cookies and greeting cards, for when you get tired of floral products or want to nibble and browse while they box your flowers. I caught them once just as they were pulling a fresh batch of cookies out of the oven. Those chocolate chip creations tasted as good as they smelled, too, and they weren’t those dinky sizes you find in packages in grocery stores. Once in a while when I’m back, I’ll stop in and order flowers for my sister, but mostly, that’s just an excuse to say hello. The best sandwiches are the “ready-mades” at Richman’s, back on Riverview and down a few more blocks. Ground beef browned and chopped up until it’s good and crumbly, mixed with a tad of onions and some other ingredients I can’t figure out, wrapped in slick paper. Slap on some mustard and catsup, and down it with a handmade malted — and you’ve discovered heaven. You can enjoy your meal at one of the metal table and chairs, or take a stool at the counter and watch ‘em fix ‘em up for right there. Quite regularly, two sweet little girls make an appearance and plop themselves down at the counter or a nearby table with their dolls, dress up shoes and somebody’s discarded purse. The girls are quite used to being part of the noontime crowd. Their parents own the diner and not only the workers, but their neighbors who stop in for a bite, keep an eye on the girls, to make certain no harm comes to them in their play. If you’re a stranger, the girls will come to your table, introduce themselves and say hello. That’s so they can find out who you are or who you know, to figure out what you’re doing in their town. Across from Richman’s, the bank of the river is open and free of obstructions, blessing you with an opportunity to see for yourself why the Mississippi is called mighty. If you park the car to get a closer look, you’ll notice there are no meters here or on any other area of town. Since you won’t have to worry about a ticket, you can walk right up to a bench and sit a spell,taking all the time you need to let your mind slow down a bit. There isn’t much traffic, so you’ll notice it more. You’ll turn at every car, SUV, or truck that meanders down Riverview. A door slams down the street and a deep voice bellows, “Thanks, Jim! I think I got the right bait now.” You turn to look and see a fisherman heading towards his truck which has a fishing boat rigged up behind it. The door you heard slamming was the bait shop’s front door. A couple other fishermen and a young boy walk out behind the first man, continuing the conversation as to where there is the greatest chance the fish will be biting. The lively discussion is friendly and animated. The twelve-year old with them is a son to one. He was quite adamant about being old enough to pick out his own fishing reel now, so his proud dad let him. The boy was beaming, and carrying his reel like it was the Holy Grail itself. “Thanks, Harriet! I’ll check it out at the other store.” You turn your head a bit more and see a middle-aged woman waving from her antique shop. She’s just told her customer – and friend — friend the name of the other store that carries what she is looking for. This bit of information was exchanged along with the news about the owner’s dad who just had surgery, and the customer’s husband, who was finally getting around to doing their yard work. That child you hear laughing is a little girl riding her tricycle on a sidewalk a few doors down. She just turned four and loves riding outdoors. Her tricycle has a tiny bell on it that she is ringing, to signal people on the sidewalk that she’s coming. But you see there is no one coming down the sidewalk, just the little girl‘s mom walking behind her. The little girl is delightfully happy, and the mother has a peaceful look on her face. They walk past a small home where two sets of couples are walking out. “Yep. Can’t keep us away if you are offering up that apple pie of yours, Marlene!” Good-hearted chuckles float across the street to your bench. A car horn honks briefly, and the sheriff’s deputy rides by, waving to the couples. They wave back. You listen to the street get quiet again, and turn back to gaze out across the river. The surface of the water shimmers in the sunlight. The shimmer seems to stretch out, creep up the bank and come to rest on your shoulders as a bright ray of warmth. There is a slight breeze in the air that gently caresses your cheek. White gulls do a flying ballet above the river and close to the sandy edges, just for you. Eagles decide to step on stage and dive for fish directly in front of you, allowing you to see their enormous grace and wingspan. Fishing boats sit contently in various spots on the river, offering up a sense of peace and eternal patience. Back on land, the birds are chirping loudly and happily. Robins are walking on the grass near the bench, pecking at the round. Sparrows sing from the smaller trees nearby. Time to get moving again. There is still more to see of this town and its area. Only a block or so south from Richman’s is Wagoner’s gas station, where you can shoot a game or two of pool while you’re waiting for your takeout order. Behind Wagoner’s is a large building that’s actually a construction shop, though you wouldn’t know that looking at it, as it doesn’t have any sign posted informing you what it is. Just ask the Bellevue folks and they’ll tell you there isn’t any need for a sign on the building, everybody already knows the owner and what he does: he builds houses, additions to your home or barns, or whatever you need built. His contractors don’t need to know where the shop is, either, because they don’t stop there. They just ring the owner on the phone and drive out to his house to conduct business. Bellevue’s a friendly town and if you’re welcome in a man’s shop, you’re generally welcome in his home. There’s a lumberyard in the next block at the end of town. The lumberyard’s owner brought in the modern age when he made computers part of the business, and expanded his buildings. Construction is good: new homes are always going up. Tourists from Illinois are deciding to buy property here, too, and build. “Town’s going to be full of strangers some day,” the manager remarks, shaking his head. Past the lumberyard and up the hill over a bridge is a large bluff, the top of which serves as a small state park. There’s a orner of the bluff that juts out and gives a panoramic view of the city. It’s a good idea to drive up there at night. Unlike a large city, you barely see the sky for the stars. But here above Bellevue they twinkle gaily, seeming to flirt with the lights of the town below, dancing solely for their benefit. When you look down and to the right at the river where a moonbeam skims across the surface, you wonder if you are in some giant’s glass globe, because it sure feels like that and looks just as perfect. Turning left from the park puts you back onto Riverview and into Bellevue. Heading north, you’ll soon arrive at Franklin Street on the left. Franklin pulls you along the base of a smaller bluff, and to the first of two of Bellevue’s most important features: their school systems. The Catholic Church and education system takes up three of the four corners of Franklin and Fifth Streets. St. Joseph’s Elementary School (grades kindergarten through eighth) sits on the southeast corner, across from the Church. The high school, Bellevue Marquette, home of the Mohawks basketball team, is directly across the elementary school and diagonally across the Church. Right behind the high school building stands the Marquette Education Center (the Mohawks gym). In 2003, Marquette High School held less than 120 students, with only thirty-two (fifteen boys and seventeen girls) in the senior class. The two structures run the entire length of the town block. Most of the Mohawks’ parents went to school at St. Joe’s and Marquette, and even had a couple of the same teachers. The staffs of both St. Joe’s and Marquette, including the coaches and principals, don’t commute to their job from the suburbs or anything like that, because there aren’t any burbs in Bellevue yet. They either live in town or in another hamlet a few miles away. The public school, Bellevue Community, is clear across town on the west side, and takes up the entire corner where Highway 61 and the road to the county fairgrounds meet. The modern brick complex is surrounded by a paved parking lot, with ample parking for the many school buses, and modular classrooms at the back, behind the main building. Bellevue Marquette and Bellevue Community share classes. The school’s neon sign at the edge of the parking lot flashes the time and temperature, and is a spectacular advertisement for the school’s athletic team, the Comets. An event billed as “Iowa’s Largest Pork Roast” is sponsored by the Church and held over Labor Day weekend. People from all around the area make the trip to enjoy the pork dishes and the polka band. Because of the kind of music, teenagers consider it an “old folks” event, and don’t attend unless their parents force them. Teenagers are used to seeing their teachers hanging around as real people with their folks, so there’s no hesitation in high-fiving your science teacher in the park or the church parking lot. The parents have some reservation, though, about making certain their children show the teachers the respect they deserved. After any high-fiving incident, mild inquiries to said science teacher if their child is so consistently ill-mannered warrants only a chuckle, although said teacher is tempted to say yes, but merely smiles and assures the concerned parent that all necessary respect is present and accounted for in the classroom. Still, the parents keep a wary eye on their young, unwilling to allow them to grow up with an inappropriate sense of familiarity with authority figures, so as not to get out of hand and become disrespectful. But the parents need not worry too much, however. When any celebration is full of your parents, your friends’ parents, your teachers, and coaches, it’s hard to feel the anonymity that is required of a hearty prank successfully pulled off. The community enjoys its home baseball games that take place on one of two diamonds in the community park. Some of the homes around the park put up nets in front of their picture windows during baseball season, to catch the foul balls before they shatter the panes of glass. The nets haven’t always worked. When the ball does damage one of the windows, someone always has the courtesy to rush to the person’s home and let them know what happened, in case the noise didn’t alert them first. Occasionally, though, the game has to be stopped for other reasons besides broken windows — or weather. Like that time a few summers ago. The game was going great. The weather was comfortable and no one was getting overheated or too tired early into the innings. The teams were evenly matched and the fans were thoroughly enjoying themselves. Then without warning, someone yelled loudly from the outfield, “Hold up! Hold up!” Both startled and curious, all eyes turned in the direction of the yelling. It was only a matter of seconds before everyone soon saw what had caused the disruption to the game. Satisfied, they all settled back down onto the bench or their lawn chairs while the teams stayed quiet in their respective positions. The possum that had caused the alert by suddenly appearing out of nowhere, meandered in its own slow, determined, possum way, across the field and the baseball diamond, undisturbed by any young team member or fan. Once the possum had cleared the field, “Batter-r-r-r-r UP!” sounded and the game and the cheering from the fans, re-commenced. Local news is covered in the hometown paper, the Herald-Leader, and the town’s own public access television station, which is on the other side of the newspaper. The folks in Bellevue are pretty proud of both. The paper covers the schools’ sports event and contributes space to both high schools for news articles. It’s not a large paper physically, 11 x 17, but packs a wallop of information, including photos of one-year olds on their first birthdays, lots of school news on what the kids are up to, and announcements of the community breakfasts and suppers. The paper also receives news from nearby towns that are too small to have their own publication. The Herald-Leader will print “on this day in” paragraphs as well, dating back to 100 years. Much hasn’t changed with the paper since then, which is simultaneously a delight and a comfort. Bellevue’s TV channel isn’t snobbish, either. If you have a video and send it in, they’ll show it for you. When Austin purchased his tractor, his excitement caused him to videotape it and the view from the driver’s seat, moving down the road. It was broadcast a few days after it was received and ran for a week or so, to make certain everybody in the community had a chance to enjoy it. Austin’s father sells farm implements, so if any farmer was inspired by the video to want a tractor like that for his own, he could be easily obliged. There’s a train that runs through Bellevue once in a while during the day, or blows through about 3A.M. But other than that, motorized traffic isn’t heavy. Oh, sure, the high school kids will get together and drive to Wagoner’s for a video or to shoot pool for a while, to Hammond’s for a soda and back again, or to Theisen’s Car Wash to get their cars washed. Occasionally, they’ll stop at the 2nd Street Station pizza place for a bite or to hang around outside. That’s expected. But so is curfew. The kids’ parents always know where they are and why, and they expect them home on time, and they are. People in Bellevue don’t usually lock all their doors. I suppose once it grows beyond a certain point, they’ll have to. But for now, the door is open to friends and neighbors who might want to leave a platter of cookies, a note to say hello or mail that was incorrectly delivered to them. Neighbors keep an eye on each other’s homes and cars, and investigate anything that looks amiss, and will check with you to make sure you’re okay. They will also make you take an hour to walk your dog around the block, because people sitting out on a warm summer night don’t mind a bit of friendly conversation with you at the end of their long day. There are still sausage and egg breakfasts at the firehouse and regulars who have lunch and/or dinner (it’s called supper there) at their favorite booth or table at the Hotel. Bellevue has never left the era of family values, going to church on Sundays, and kids minding their parents. It is a small town of strong roots, solid values and lifelong friendships that often started in Kindergarten. It’s life on the Mississippi, small town Iowa style.